First and foremost, grant writers alleviate the burden of writing a compelling grant off of your shoulders. This makes you free to address the concerns of your nonprofit or small business. With the free time, you may come up with good points to relay to your grant writer who can put it into the proper phrasing. This takes me to the second perk of hiring a grant writer from GrantWriterTeam. Our grant writers are articulate. If you have a mission statement that could use work, one of our grant writers can help you perfect it. Also, a grant writer can help you put your goals and programs into words that convey professionalism. The third perk of getting a grant writer is that they are professional. They know how to work with you. After your initial discussion with a grant writer, he or she understands your needs and is willing to meet them. The grant writers will deliver sections of the draft to you on time (in rare instances, you can contact us ASAP for a replacement writer). Fourth, the grant writers are familiar with your funding source or will become familiar with it. It is their job to know what to address in your proposal. They learn this through experience and research. Often, our grant writers go above and beyond to recognize patterns of funding from different funding sources. This would give your proposal the edge over other agencies. Lastly, it's cost-effective. We’ve done our research and our grant writers price themselves very reasonably. Our grant writers charge $40 and up, per hour (considering their experience, he or she may charge more) and a flat rate for a complete proposal. You’d be getting the best value for your dollar, considering all the services grant writers at GrantWriterTeam.com offer (including searching for grants for you). So, if you’re a nonprofit or small business and need a grant writer, drop the complicated road signs inside your head. Request a writer and be linked to professional grant writers. You will be contacted by our GrantWriterTeam specialist, to help you move forward with your request and be matched to a grant writer. For questions, Tracy can be reached at (561)249-4129. GrantWriterTeam is where grant writers are connected to grant seekers. GrantWriterTeam is the company to work with if you’re a grant writer, a nonprofit, or a small business. As someone seeking grants, start off at GrantWriterTeam.com with the “Request a Writer” tab at GrantWriterTeam.com. It’s important to fill out all the information, in detail, so that the grant writers have as much information as possible. when you answer the questions – do not include the name of the organization (write We or Our organization, etc), we keep you anonymous until you choose the grant writer. After you are finished with the form, you will be prompted to pay a $50 administrative fee. This is for processing the writer request and for advertising your needs. Once grant writers have gotten the chance to view your writer request, you will begin receiving bids on your project. To check these out, log into GrantWriterTeam.com. Click My Writer Requests. Then, click Bid List to see who has bid on your request. On the Bid Listing, you will see all the grant writers who have bid on your project, plus their pricing structure and expertise. To view the bid in its entirety, click View. Here, you will be able to see the awarded grants of the grant writer plus writing samples (up to 3). After accepting the bid, you will then be contacted by the grant writer. You will negotiate the complete flat fee divided into a small retainer and a series of project deliverables. Deliverables are the parts of the whole project with pieces or parts of written work or research that will be delivered within an hour of the payment of the agreed upon cost. They can be sections or drafts of a grant. We recommend using sections as deliverables so that you can review and provide your feedback of additional information about your organization. After you speak with the grant writer, he/she will generate a contract based on their discussion with you. With the contract you will receive a link to view the grant writer's full resume and two professional references. Please contact these references and verify that this grant writer is in fact the best choice for your organization. If you want to choose a different grant writer – you need to do that before approving the contract. If there is something in the contract you would like to change we provide a Make Changes to the Contract button with a text box for you to explain what you want changed or modified. The button will send a message and re-open the contract for the grant writer to make those changes (otherwise the contract remains locked changes cannot be made and is waiting for your approval). Once you’ve approved the contract, you will be directed to a Pay Now button and also receive an automatic email, to pay the small retainer. Now, within My Writer Requests, you will see a Deliverable List. Clicking the Deliverable List will take you to a document where the grant writer has written out the agreed upon deliverables. The Deliverable List is an easy way to keep track of the work and the proposed/anticipated completion dates, payments and the delivered work of your proposal. When you are in the market for a grant writer, look no further than GrantWriterTeam.com. You will find courteous, professional, and experienced writers. Remember to check out your bid list after submitting a writer request and have a thorough conversation with the grant writer about what you expect and when. Each deliverable should clearly illustrate the tasks of the grant writer and what will be completed. The written material will be sent to the client after the deliverable is paid. When your contract is divided up into deliverables, it builds the trust between the grant writer and the client. Team work makes the dream work! The client will negotiate with the grant writer as to the amount of time to be spent on each deliverable, and also the payment that will be due once the deliverable is completed. GrantWriterTeam has adopted this process because it creates a way for the client to review partial or draft work and provide necessary feedback for the grant writer to complete the grant application. This system of deliverables used at GrantWriterTeam.com ensures that the grant writer is compensated for the work they do and the client has pieces in hand throughout the process. It is nail biting when the client is waiting until the due date to read their application. With the system of deliverables, the client (grant seeker) is an active participant in proposal development and their passion and ideas will be heard and incorporated into the proposal. Nonprofit, or small business owners like our system because they do not have to pay large amounts of money at once. 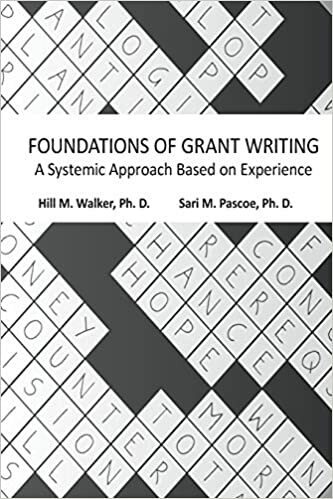 Check out Foundations of Grant Writing: A Systemic Approach Based on Experience by Hill M. Walker and Sari M. Pascoe. Dr. Pascoe has been a national and international grant writer for the past twenty years and offers her acquired wisdom in this book. This book will provide you with strategies that may give you an advantage over your peers. Grant writers, sign up as a writer. Grant seekers, request a writer. Or, call us at (561)249-4129. About the Author: Tracy is dedicated to providing the best practices, that will make both the grant writers and the "grant seekers" have a seamless experience.